The PullOver is a great exercise that targets the serratus, chest, and lat muscles. Here's how to perform with the kettlebell. Now there are tons of variations to this exercise but for this video we perform them lying down on the ground and are elbows locked out to target our lats more than our chest. 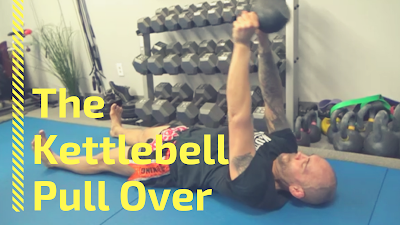 Grab the kettlebell by the horn and roll over. Keep your chin tucked, abs engaged, back and legs completely straight throughout the exercise. Bring the kettlebell straight up. While keeping your elbows locked, lower the weight with control as low as your shoulder mobility allows you to. Pull the kettlebell back to the starting position.